Last night I was part of a pretty amazing event. It was the Starlight Ball, benefiting the Children's Hospital Foundation (formerly Chidren's Medical Research Institute), and it was fun! I was a model in the fashion show they had as part of the evening's entertainment. Ruth Meyers Inc., in Nichols Hills, provided all the clothing. Ok, can we first talk about their decor?! I would kill to have our decorations for our CF gala look like this! Inside, it wasn't even recognizable as the Oklahoma Golf & Country Club. They had the walls draped with white fabric, and colored uplights completely set the mood of each room. There were touches of mirror and silver everywhere. They even had silver sequin tablecloths, people! I don't mean some sequins scattered about the fabric. The ENTIRE thing was sequins. It would be so inappropriate on my kitchen table but I have to admit I was doing some coveting. You can kind of see here how the had the runway set up. We walked in a U-shape through the chairs. I really enjoyed doing it that way with the people that close. It had better energy than most runway shows I've done. In the bottom right corner of the next picture you can get a glimpse of the aforementioned table cloth. Ok, so now that the "drooling over the decor" portion of this post is finished we can move on to pictures that actually have people in them! I was so excited to see Lauren Masters (far left) there as one of the models! She was second runner up at the pageant. You may remember her in her gorgeous gold gown in my pictures of that night. 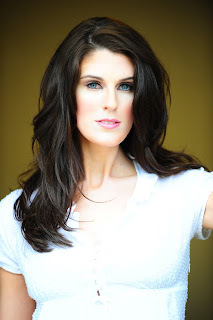 In between us is the oh-so-beautiful Heather Rouba, Mrs. Oklahoma 2009. She has become such a good friend of mine and it is fun that we can do events like this together. 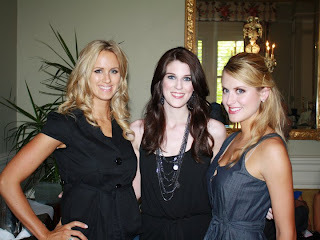 Here Heather and I are with Cortney Smith. She is another friend from the modeling world that I have worked with for a long time. It was good to see her there. I love this pic: tan blonde, pasty brunette, tan blonde. Speaking of pasty... Note to self, if you are going to be wearing a bikini in front of hundreds of people, it might be smart to break out the self tanner. Yes, we are wearing fur coats over our swimsuits. All of us had to. It was definitely an eye catching start to the show! Here we are with some of the other models. All of the girls in this picture, except me, are with Heather's modeling agency, Anthony David. They all did a wonderful job. We won't talk about how much younger than me they are. It was a really fun event, and for a wonderful cause! On Wednesday morning I met with Jan Dunham, director of the Children's Miracle Network. I learned more about what they do and found out that their Champion Child for the year is a 13-year-old girl with cystic fibrosis, Shea Retherford. The money that CMN raises actually goes to the Children's Hospital Foundation. The money is used for endowments to bring the best doctors and research scientists to OU Medical Center and the Children's Hospital. So many of our state's top specialists, and so much of the amazing research that has been developed here, are a result of these endowments. I am excited to work with Jan and the Children's Miracle Network this next year! I will be speaking with Hayden at their telethon on June 6th and I hope to be a part of many other events to come. I have really enjoyed my week so far and have a lot more coming up! Stay tuned! Please pray for Tamara Mathews. 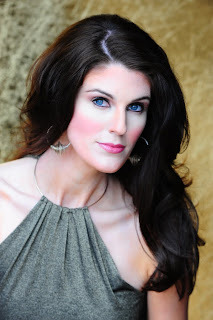 She is the official makeup artist for the pageant (the one that did my amazing makeup for my headshots) and is the sister of my director, Tracy Crist. She was in a horrible car accident this morning and is in surgery right now. Apparently there is the possibility that she might lose a hand or an entire arm. Please pray for Tamara and her health and recovery and for the surgeons as they do their job. Thank you! Today has been hard. 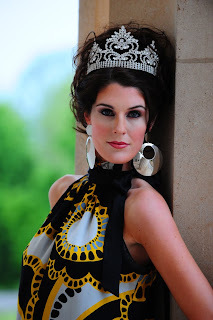 Ever since I was crowned Mrs. Oklahoma two weeks ago, I have been going full speed ahead. I have been busying myself with appearances and appointments, planning trips and making new connections, keeping up with blogs, Facebook pages and Twitter accounts.....and I have loved every minute of it. This opportunity I have before me is such a blessing - one in which I am still trying to process the enormity. In between all these busy moments, however, I have been trying to come to terms with the most difficult event in my life to date. The Tuesday before the pageant, April 13th, 2010, my father, Brad Baldwin, passed away at the age of 63. While he had been in the hospital for several months, he was supposed to have a full recovery so this was very sudden and shocking to both me and my mother. The doctors believe he went into cardiac arrest. My father had the most beautiful exit from his earthly body into heaven. My mother, my husband and I, along with my parents' long-time best friends, were gathered around Dad. Our pastor was there with us also. We asked that his ventilator be turned off and our pastor began reading a verse from 2 Timothy in the Bible. "I have fought the good fight, I have finished the race, I have kept the faith....". And just within those few sentences, my dad was at peace. I knew I still needed to compete in the pageant but at that moment I wasn't sure if I would be able to. Walking around in a swimsuit with a big smile on my face just didn't feel appropriate to me. By the next morning, however, I told my husband,Ryan, and my mom that I was going to go through with it. I was going to do it for two reasons. One, my daughter, Hayden, still needed her cure - nothing had changed about that. And two, my dad would have killed me if I dropped out because of him. He had been so excited that I was doing it and he was really having a hard time with the fact that he was going to miss it. I grew up doing music theatre and had at least four shows a year from age five all the way through college. My dad NEVER missed a performance. Well, he still holds his perfect record. I know he was there with me that night, watching over me and giving me the strength to make it through. I actually felt him there. Today was hard because I finally had to tell my daughter about Dad. She came out of her bedroom tonight and told me she wanted to see her silly Pa-Pa - when would she get to see him? I took her back into her bedroom, sat with her on the bed, and took her hands into mine. I told her that Pa-Pa wasn't sick anymore. I told her he was an angel with Jesus now and that, even though we couldn't see him anymore, he was with us all the time. She had a few questions but my daughter is very wise for her age and she knew what I was saying. She climbed into my lap and we cried together. To be quite honest, I haven't allowed myself many times to cry yet. One of the hardest parts of my father's passing is worrying that Hayden won't have any memories of him someday. That she won't remember how crazy he was about her. But maybe she will. That is one of my prayers. I was extremely proud to call Brad Baldwin my father while he was on this Earth, but the pride I feel now of the person that he was has grown tremendously since his passing. Mom and I have been hearing so many stories from friends and acquaintances of Dad about the things he did for them when they truly needed a friend. There was the story of him making a phone call every week to a friend that lost his job. He just wanted to check on him, make sure he was ok, and constantly give him a new phone number of someone that might have a job for him. Or the time he drove to the house of one of my mom's friends who was going through a separation - just to give her a hug and tell her he was there for her if she ever needed him. There are so many more stories like these and Mom and I had never known these things had happened. I was always so proud of my dad's abilities and his strength, but now I find that I am immensely proud of his character - of the person he was when no one was looking. I want to be like my dad, now more than ever. I want to learn from his example of how a truly selfless person lives their life. These past couple of weeks have been bittersweet for me. I am so excited and thrilled about what I can do to better my daughter's life, but sometimes I feel heartbroken that my daddy is not here to see it all happen. Then I remember, though, that he is seeing every bit of it - that he is even more proud watching me from above than he would be down here on Earth. And each day I feel a little bit more of his strength, and I gain a little bit more motivation to carry on the legacy of who my father was, and, most of all, I strive a little bit harder each day to be the kind of parent that he was to this little girl who loved him so much. During my reign over this next year I will have my emotional ups and downs. I will have some amazing accomplishments and I will have some disappointments. 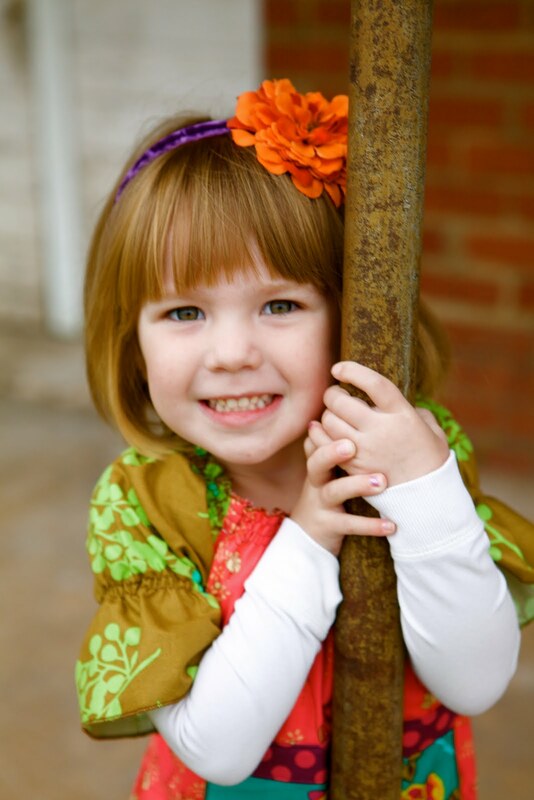 I will fight as hard as I possibly can to make sure my daughter beats her disease and has a long and healthy life. I will have an amazing journey that I will carry with me forever...and I will do it all with my daddy at my side. "For I am already being poured out like a drink offering, and the time has come for my departure. I have fought the good fight, I have finished the race, I have kept the faith. Now there is in store for me the crown of righteousness, which the Lord, the righteous Judge, will award to me on that day - and not only to me, but also to all who have longed for his appearing." 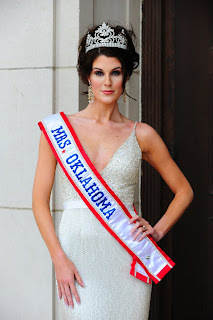 Edmond Life & Leisure did a cover story on me and the Mrs. Oklahoma pageant. Click on the link to check it out! to sign up for Great Strides! The walk is May 8th and you have plenty of time to sign up to join our walk team and to order your t-shirt! The website also has a link for donations. 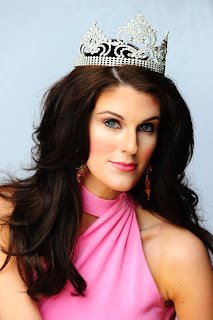 I wrote a post with all the details earlier but it was before I won Mrs. Oklahoma and I don't know how many of you were reading my blog at that time. Soooo, here it is again! Just click on the link! I had so much fun at my first appearance as Mrs. Oklahoma! Heather Rouba, Mrs. OK 2009, asked if I would like to emcee with her at the Festival Idol competition at the Arts Festival. Each night this past week kids have been competing. The winner from each night was awarded the chance to compete in tonight's finals and one of them would become the Festival Idol! Congratulations to the Jacuzzi Lifeguards, a band of teenagers from Norman, for winning last night's preliminary! Heather asked me if I would like to join her for the Friday night competition and I thought it sounded like a lot of fun! Had this competition been around when I was a kid I soooo would have auditioned! It was right up my alley! 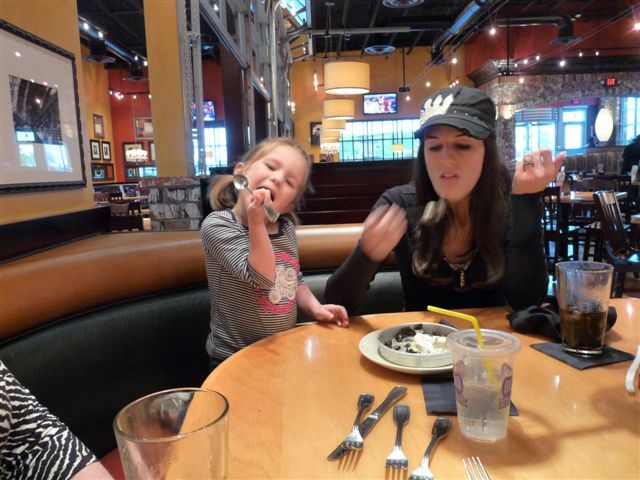 Here is Heather giving me the lowdown on what I am supposed to do. Heather went on stage first and gave me such a lovely introduction. And then it was my turn! I think it's impossible to get flattering pictures of a person while they are talking and gesturing (and I do plenty of the latter!). While the judges deliberated I had a chance to talk about cystic fibrosis! Yay! Ryan did a wonderful job at his first appearance! He took care of my purse and crown case and took lots of pictures! More importantly, he was extremely supportive and helpful. He is going to be such a large part of my success this next year. Here we are with Heather and her husband, Yuri. If we look content and happy it's because we just finished eating macaroni and cheese from the Sage booth! Here are some of the pictures taken last weekend with my camera. The official pictures from the pageant are coming soon, but I thought it might be fun to share these as well. On Friday night, we have a dinner with our husbands. I'm not quite sure why I have no pictures with my husband at this dinner but here are some of my friends! After the dinner, Ann and I decided it was much too early to head back to the hotel. It was only 7pm and it was a date night with no children! We had to take advantage! We drove around and found Stables restaurant. Ann and I quickly located the dessert counter. Even though we had swimsuits to wear on stage the next night we could not resist these yummy pieces of cake! Me and Ann and in our opening number dresses. ....and in our evening gowns. With Lauren Masters. Lauren was 2nd runner up! With Marci Stager. Marci was the 3rd runner up! With the gorgeous Heather Rouba! This was a shot of me coming off stage after being announced as one of the top 10. I was excited! After the pageant, Hayden was eager to wear my new crown! With Ryan at the afterparty. He looks so nice in his tux! I guess we can call him Mr. Oklahoma! Me and Heather in our crowns and banners! With Hayden. She was getting sooo sleepy! I thought I'd just throw this in there! This is me the next morning before an entire team of people made me over for my photo shoot. This is what I actually look like! Ha! At a Cystic Fibrosis Foundation conference in Washington, D.C. a couple of years ago, I met the owner of BJ's restaurants. His teenaged daughter has cystic fibrosis and he has used his restaurant to raise money for the CF Foundation in a really fun way - especially if you have a sweet tooth! 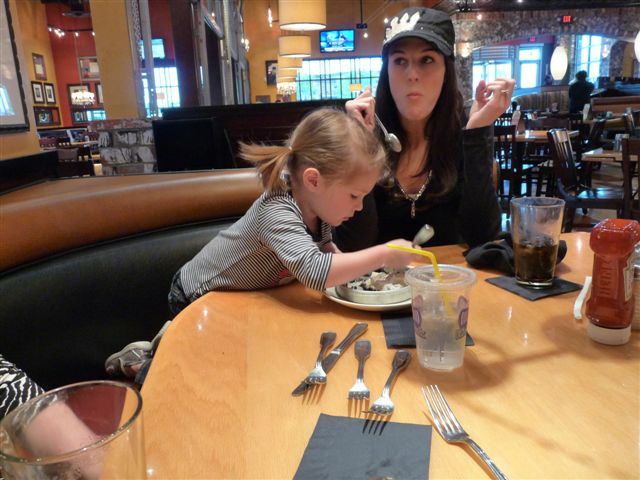 At all the BJ's restaurants nationwide, there is a program called Cookies for Kids. 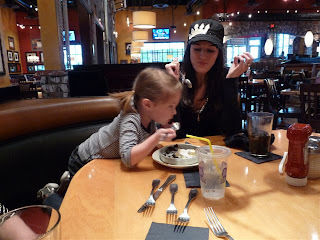 Any time their dessert, the Pizookie, is ordered, one dollar is donated to the CF Foundation. Because of this program, BJ's has donated MILLIONS of dollars for CF research! If you have not had a Pizookie you MUST. It is a huge cookie in a skillet, served warm and topped with ice cream. There are several different ones to choose from. My daughter, Hayden, received my sweet tooth through her DNA and she loves these every bit as much as I do! 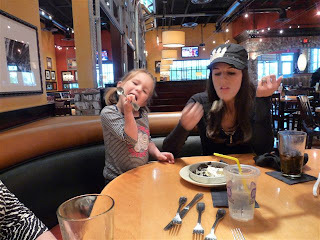 Here we are this past Tuesday enjoying our cookies 'n' cream Pizookie. There was NOTHING left when we were done with it! If you live in the OKC Metro area, visit the BJ's on Memorial in front of Quail Springs Mall (next to TGIFridays) and order a Pizookie! If you don't, visit their website http://www.bjsbrewhouse.com/ to find a location near you! Today I met with Camden Maxwell at The Paper Lion in Edmond. She, and owner Bruce Maxwell, agreed to be a sponsors for the Mrs. Oklahoma pageant again this year and I am so grateful! I went into the store today and Camden completely took care of my stationery needs for this next year! They have so many wonderful styles to choose from. If you need personalized stationery or invitations, The Paper Lion is the place to go! Thank you again, Bruce and Camden. I am looking forward to helping out at your open house this June! If you would like to schedule me for an appearance, please don't hesitate to contact me. You can email me at mrsoklahoma2010@yahoo.com. I would love to speak, sing, volunteer, sign autographs...you name it! This past weekend I was crowned Mrs. Oklahoma and I feel so blessed! I have such an amazing opportunity before me to truly be a voice for people living with cystic fibrosis and I can't wait to get started! 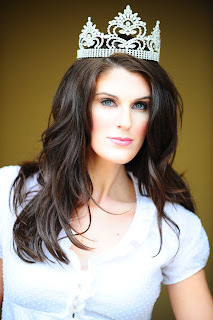 As someone who spent her entire youth in music theatre, I am also excited to promote the importance of music education, as MENC is the national platform for the Mrs. America organization. I hope you will follow me here as I take this journey! Here are some of the pictures from my official Mrs. OK photo shoot. I am so grateful to Larry Wright, Tamara Mathews and Jo Ann Peterson for making me look beautiful! Soon I'll be posting some pictures from backstage during the pageant weekend so check back! I am hoping you can take a few minutes of your time to help be a voice for people living with cystic fibrosis. Below is the link to information I received from the CF Foundation that I wanted to pass on. While there are several things about the new health care reform bill that will greatly benefit those with CF, a critical part has been left out of the bill where clinical trials are concerned. We need you to write your representatives by visiting the link below and ask them to pass the clinical trials bill in 2010. This bill would ensure that people would not have to give up their primary health benefits if they choose to participate in a clinical trial. The foundation has made everything so easy for you. The letter is already written. You just enter your info at the end and it automatically sends it to your state representatives. If you live in OK, it will go to Mary Fallin, Tom Coburn and Jim Inhofe. You can also attach a picture with a caption at the end so I am posting a picture of Hayden below and you can use it if you like. Hopefully you can just right-click and save it to your computer. I love the idea of the three of them seeing Hayden's picture over and over! There is also a place you can check mark to become an advocate for CF and receive further emails like this one. I really would appreciate your taking the time to do this on behalf of Hayden. It should only take a few minutes. There will probably be clinical trials she can participate in in a couple of years, so it is very important that this passes.